Culture of drinking tea has been known in China since 3000 BC, since the emperor Shen Nung in power. Then the drinking tea culture continues in Japan since the time of Kamakaru by followers of Zen. The aim is that they get the freshness of the body during meditation that could take hours. In the end, the tradition of drinking tea became part of the Zen ritual. During the 15th century it was used as a permanent event to discuss various things. Fluoride (F) is quite high in tea, can help in preventing the growth of caries in the teeth and strengthen the tooth. Catechin elements (one element in polyphenols), have proven that these elements have the ability to stop the growth of some bacteria that cause food poisoning (according to research from Taiwan and Japan). Catechin, it also has been demonstrated that can reduce the accumulation of cholesterol in the blood and accelerate the removal of cholesterol through the stool and can inhibit the occurrence of mutations in body cells and neutralize free radicals . With the presence of vitamin C and vitamin E,tea can also help strengthen the immune system. 4. Tea contains caffeine which is different from a type of coffee, then tea can also stimulate the nervous system of our body so that the uptake of oxygen into the body more smoothly. 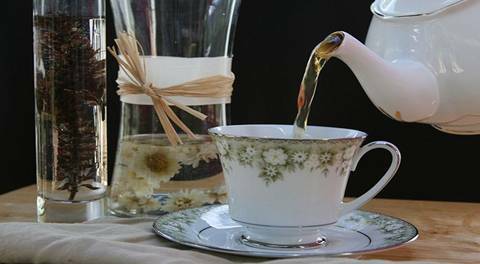 Manganese (Mn), contained in tea could help breaking down sugars into energy. Thus, tea may help keep blood sugar levels. The reaction between polyphenols (tannins) in tea with amino acids of protein will form complexes that are difficult to separate. Complex bond is very strong, so it can cause problems to the body metabolism. Complex formed can not be absorbed by the intestinal wall, consequently, the protein from the food can not be utilized by the body. so, to gain maximum benefit from food and beverages, tea should be consumed separately, 2 or 3 hours after eating is a good time for tea.